﻿ Rep. Gubernatorial Candidate DeSantis Robbing Voters of Debates with Democrat Gillum: Why? Rep. Gubernatorial Candidate DeSantis Robbing Voters of Debates with Democrat Gillum: Why? FLORIDA – Republican gubernatorial candidate Ron DeSantis has refused to talk about Florida issues, while refusing to lay out a substantive policy platform. Last week he slammed the door on two reporters who asked about his associations with far right extremists and canceled an interview with the Tampa Bay Times about his policy agenda. But the worst of it was Mr. DeSantis' supreme insult to Florida voters: on the morning of September 15, he ducked a challenge by Democratic candidate Andrew Gillum for three debates before the election. In an interview with the Tampa Bay Times, DeSantis refused to commit to even one of the general election debates proposed by Gillum. Mr. DeSantis' tactics did not go unnoticed. • During the Republican primary, he appeared multiple times a week on Fox News, but almost always talked about national issues, such as the special counsel Russia probe. He rarely made himself available for one-on-one interviews or invited journalists to hear him talk with voters. On the stump and in his advertising, he talked much more about combating illegal immigration than his agenda for governor beyond beefing up civics and vocational education and following the course set by outgoing Gov. Rick Scott. • DeSantis, 39, overwhelmingly beat Agriculture Commissioner Adam Putnam in the Aug. 28 primary, but he's continued to keep quiet about his agenda as governor. • His campaign confirmed several days ago would sit down with the Tampa Bay Times to discuss his position on issues facing Florida between campaign stops in Pinellas and Hillsborough Counties Tuesday. The campaign cancelled Tuesday morning, saying they wanted to give him time to flesh out his platform before taking questions. A day after Mr. Gillum's debate challenge, Mr. DeSantis still had not agreed to even one debate. The Florida Democratic Party claims that Mr. DeSantis refuses to debate Mr. Gillum because "he can't beat Andrew Gillum on the issues." As of today, Monday, September 15, Mr. DeSantis is still ducking the debate challenge. Sunday afternoon, Mr. Gillum renewed the debate challenge, including one hosted by Leadership Florida and Univision 23 and committed to a third town hall debate hosted by CNN. His attacks on Mr. Gillum come as he has struggled to answer questions about his attendance at racist conferences hosted by right-wing extremist David Horowitz. Three weeks into the general election, Mr. DeSantis is also facing criticism for failing to articulate a policy agenda. The Orlando Sentinel reported that Mr. DeSantis, ignoring one of the voters' top concerns, “hasn’t yet unveiled a detailed health care plan". Like the chicken-hawks of the sixties, it is time Candidate for Governor Ron DeSantis stepped up to the plate. If he doesn't, he may discover that this time around, Florida voters are not as stupid as he thinks. 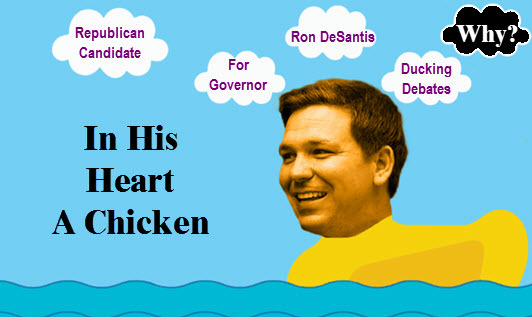 While he parades around in the body of a duck, on Election Day, people may decide they don't want a governor with the "Heart of a Chicken." * After this Op-Ed appeared, Mr. DeSantis tentatively agreed to five debates.